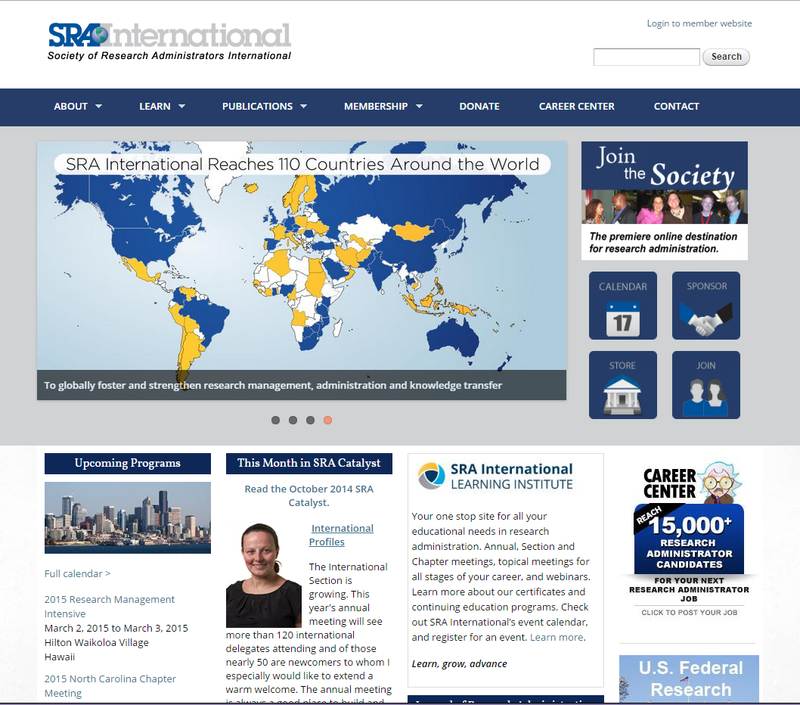 The Society of Research Administrator's International (SRA) came to SoH for a complete website redesign. Their original site looked out of date, but, more importantly, was not secure and hard to update without technical support. SoH conducted an extensive discovery that covered branding, competitive landscape, audience analysis, and organizational goals. We found that the existing website was completely misaligned with our discovery findings. We recommended shifting the focus of the website to better align with their membership needs to drive awareness, event attendance, member acquisitions, and renewal rates. Our presentations to both the staff and the Board of Directors confirmed that our new strategy was accurate and maintainable. We completely revamped the website by building on the Drupal platform, opening the door to easier content management, integration, complex functionality, and security. All content was reviewed for relevance and messaging. Content models were designed and implemented to create logical structure on the site and facilitate author ownership. The home page design features a custom image slideshow, and serves as a portal into various sections of the website of interest to the audience. The website is integrated with Avectra NetForum Pro, providing single sign-on capabilities and the ability to add premium member's only content directly on the website. The site is fully responsive, with well thought out display capabilities across all device types giving each user an optimized experience. The meeting calendar was the biggest challenged we faced, as SRA conducts dozens of meetings each year across its governance structure. Using sophisticated tools in Drupal, we were able to create entire microsites for each meeting, automating the creation of the menu systems so that each event can have its own customized set of pages. This process reduced staff administration time for managing each meeting, and completely eliminated the need for technical support. 2016 brought the integration of their member curated content with the website. Using Drupal Workbench, we provided members the opportunity to submit articles for review. The four stage review workflow is completely controlled within the website. The system replaces their outdated proprietary system that required manual review and entry of content. By integrating with the website, members only have one place to visit to get all recent news, and the site has more dynamic content for better SEO. The next phase of the project will bring an updated appearance to the front-end of the website, without any interruption to the content or functionality.